Well, since I'm on a food kick now, I thought I'd share something else from the old site that I had in my downloads folder all this time. 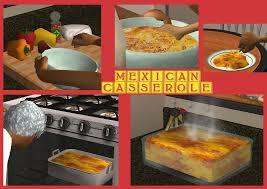 It's Mexican casserole. It's only available for lunch and dinner. It's found with a new pie menu of Serve a Meal.../Mexican Casserole or Have a Meal.../Mexican Casserole. Both of the files in the .zip are required in order for it to work properly in your games. It's cloned from Cheesecake so Open For Business Expansion Pack is Required. Enjoy! My sims are going to have a real feast ;)))) Thank you very much!